Simple and deliciously perfect! 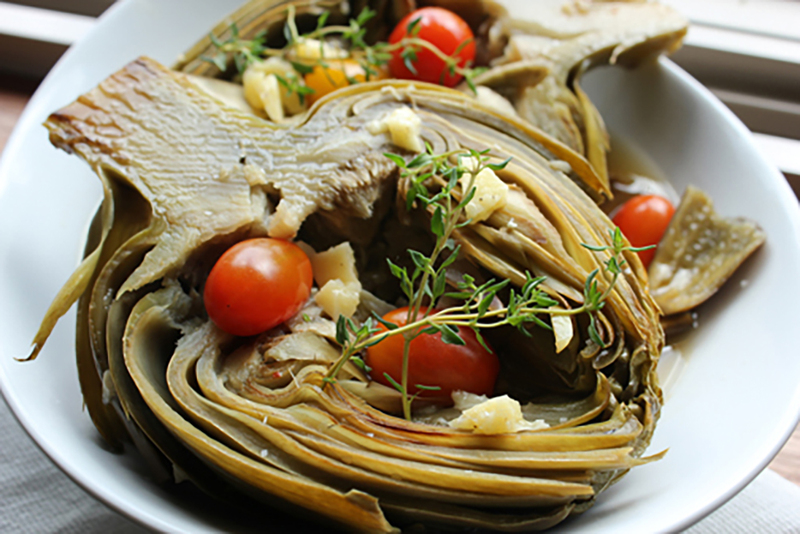 A braised, flavorful artichoke is a treat and this recipe is fantastic. It takes a bit of prep time but it is well worth it. We enjoy serving these as a first course for a dinner party but they are also a great vegetarian option or a light dinner option with a nice glass of white wine. This recipe was inspired by a dear friend and one of our favorite chef’s Dena Marino. If you prefer, thyme, mint or Herbes de Provence to oregano try any of these for a flavor variation. For extra flavor, brown all six artichokes cut side down until they a golden brown. 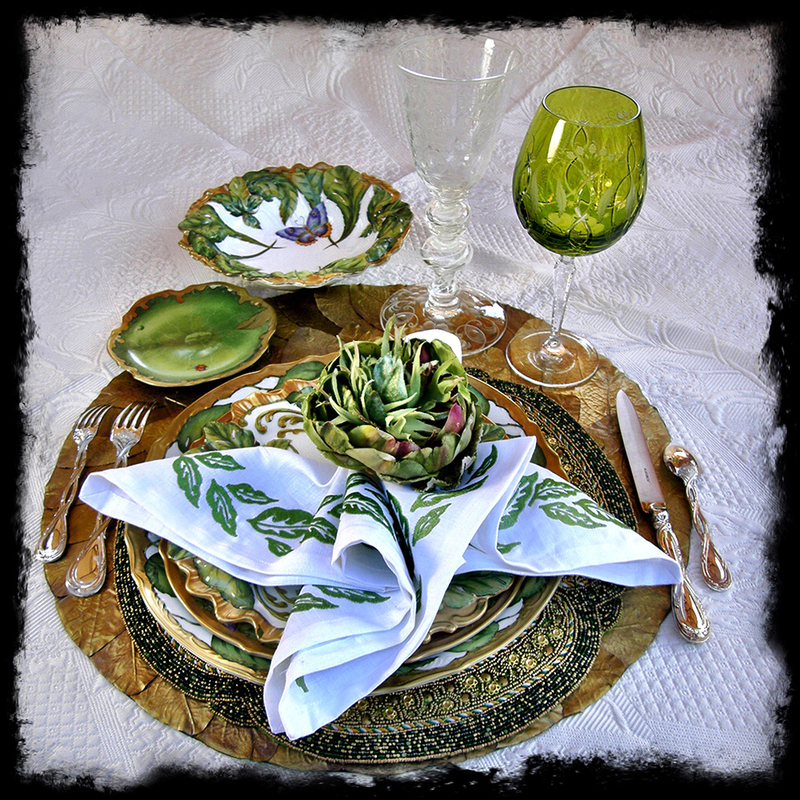 Now don’t forget to set a pretty, artichoke inspired table. Rinse each artichoke and trim 1/2-inch off of the stalk. Trim 1-inch off the top of each artichoke. Trim the remaining leaf tips, by snipping with a pair of scissors. Cut each artichoke in half, from stalk to tip, and remove the choke with a spoon. Remove the tough outer leaves and trim the outside of the stalk with a paring knife. Place the six prepared artichokes on a baking sheet or pan and squeeze the juice of 1 lemon on cut surfaces to avoid browning. In a large flat bottom sauté pan large enough to accommodate all six artichokes, heat the olive oil and butter on med-high heat until it bubbles. Brown all six artichokes cut side down until they a golden brown. Reduce heat and add the stock. In a bowl or measuring cup combine the white wine, garlic red peppers, the juice of the remaining lemon and oregano, and add mixture to the pot. Simmer and cover the pan. At this point you can leave it simmering on the stove or put the pan into a 400F oven for approximately 1 to 1-1/2 hours. When done the artichokes should be tender and the leaves should detach easily. Remove and plate each artichoke in individual bowls. Add the lemon zest to the braising broth and adjust seasoning with salt and pepper to taste. 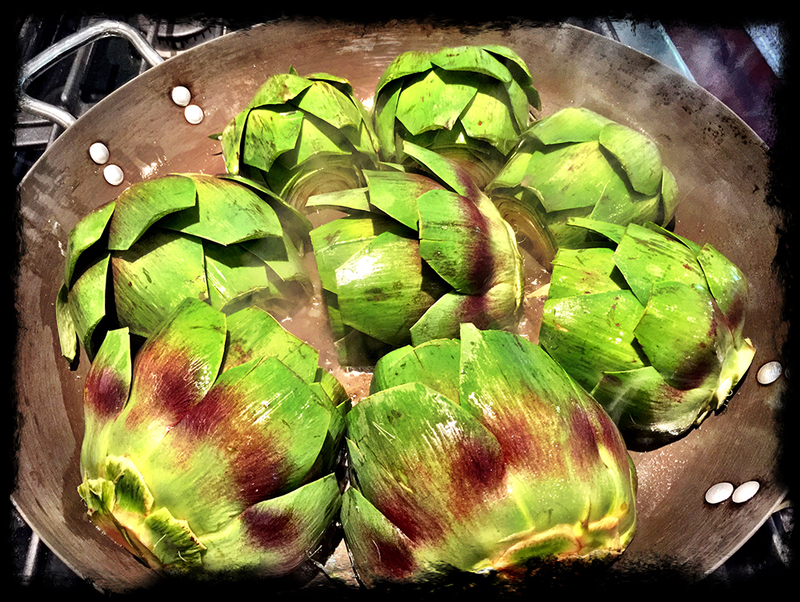 Ladle each artichoke with some braising broth. 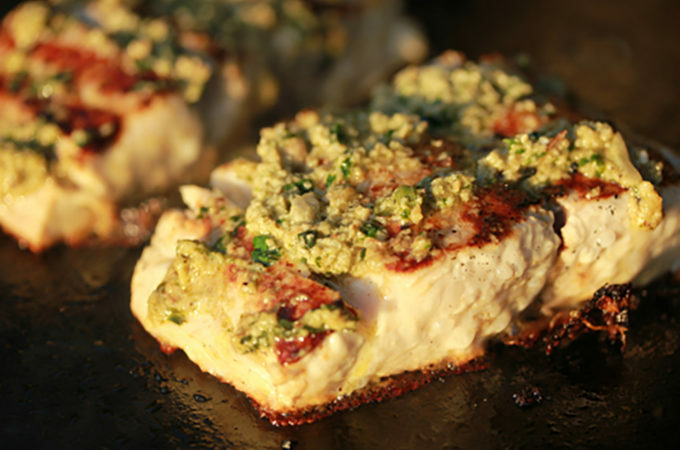 Serve with crusty toasted or grilled bread simply rubbed with a garlic clove for flavor. Garnish with a sprig of fresh oregano or herbs, some shaved pieces or Parmigiano-Reggiano and some cherry tomatoes for color.